Whether you are a serious collector, need to find that special item or have a passion for nostalgia and small antiques, these are the shows for you. You're sure to find something unique for your collection or fill that empty space that will put the perfect finishing touch on your decorating. 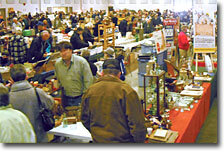 Often, these shows feature more than 100 vendors with a wide variety of items. Even if what you're looking for is not at the show, come talk to the vendors, they are your ideal source for locating that missing piece. But these shows are also more than a collectors dream, they are the ideal family outing where you can reminisce about days gone by and even show a younger generation treasures from the past. Yes, they are great for the entire family! • Vintage Collectibles from the 30's, 40's, 50's, 60's, and 70's.